How Do You Spell MACE? 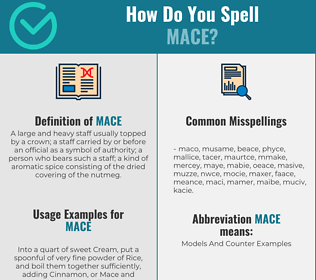 Correct spelling for the English word "mace" is [m_ˈeɪ_s], [mˈe͡ɪs], [mˈe‍ɪs]] (IPA phonetic alphabet). Below is the list of 293 misspellings for the word "mace". A large and heavy staff usually topped by a crown; a staff carried by or before an official as a symbol of authority; a person who bears such a staff; a kind of aromatic spice consisting of the dried covering of the nutmeg. What does mace stand for?